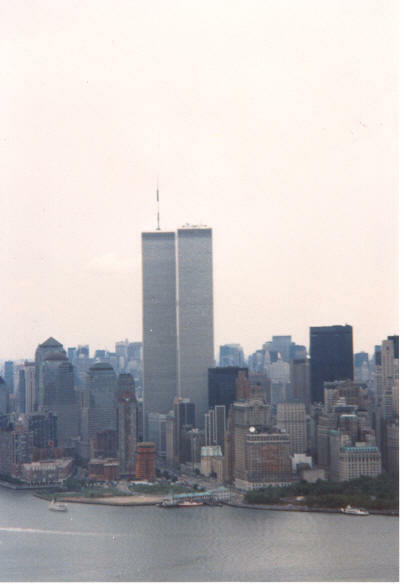 As I flew past it in 1990, how could I or anyone imagine that this symbol of New York would be the site of the worst mass murder in American history. Flying at 800 feet, the top of the TV antenna on the North Tower stood one thousand feet above us. The South Tower, first to fall, is at the right. Something will rise in it's place - a city can bear no scars, only it's citizens. We bear the pain today, but I firmly believe that a better New York and a better America will be the legacy of those who perished here. April, 2005 Update: I was wrong when I wrote these words a month after 9/11. America has been severely weakened by the attack. In the ensuing years, our greatest strength - liberty - has been wrested from us by our own Government under the guise of "Homeland Security". The goodwill and sympathy we engendered from decent people all over the world has been squandered when we attacked a country that had no part in 9/11 and posed no threat to America. Aviation also has suffered. Boarding a commercial flight is preceeded by an invasive search far in excess of that which should be tolerated by a society dedicated to liberty. Private aviation now has stifling restrictions placed upon it since 9/11. But, I remain the optimist. The American people will arise from their slumber and will re-read our Declaration of Independence. They will reacquaint themselves with our Constitution and will once again, "Proclaim liberty throughout the land." And we will be strong again.